Rare Breeds Farm trip – where toilets were even rarer. Last week I went to the Rare Breeds Centre near Ashford in Kent. It was a day out with my husband, my sister in law and nephew to enjoy all that Highland Farm had to offer. I never thought that I&apos;d have any trouble finding a toilet because the farm is run and owned by the Canterbury Oast Trust (COT). They support adults with learning difficulties (some of whom use a wheelchair) who are working and volunteering around the site. I imagined it to be super accessible in the toilet facilities although I did know from their website that they had no hoist or bench. The first thing we do when we go out is check the toilet facilities to see if we can manage. My husband would be lifting/dragging me from my chair to the toilet. I am female – with a male assistant which becomes very relevant when we find out there is no unisex toilet in the outside toilet block. There is only an accessible cubicle in the men&apos;s and women&apos;s toilets. I generally can&apos;t use cubicles as they are not big enough for my extra small power chair plus assistant. This causes a temporary panic. What if we had to go home or drive several miles into Ashford to find a toilet? This was supposed to be a lovely once a year opportunity for a day out with our little little nephew. We went inside the restaurant and I saw there was a sign to toilets and baby changing. Hurrah. I ask a member of staff where I could use the toilet and she escorted me through the doors I could see marked for more toilets. There was a ladies toilet with a large cubicle – so my husband would still have to loiter outside the cubicles. How would you react if you were a women going to the loo and a man was hanging around inside? This is embarrassing for my husband and can you imagine a parent&apos;s horror when their child reports a man was in the toilet. This is a farm for children and staff / volunteers with learning difficulties – which could lead my husband open to abuse allegations or scare the living daylights out of people. Also, the toilet (below) had a none standard support rail meaning it offered no support when sitting on the toilet – ( it&apos;s located too far forward) so not usable at all for me. The hand dryer is not reachable in the corner and there is no emergency cord. All in all at this point there were no usable toilets. I had attended conferences and training events in the adjoining training centre, so I knew I had used the toilet inside. I asked if I could use these and staff went off to see what they could do. Thankfully they opened up the centre so I could use the toilet ….. we&apos;ll sort of. This was not a good experience. I had forgotten that the accessible toilet room was built inside the Men&apos;s toilet facing the urinals. Luckily as there were no events on, the toilets were only used by staff so limiting the chance of them being used whilst we were in there. The problem here was that the accessible toilet room (inside a room!) was smaller than a standard unisex toilet. In fact, as I parked next to the toilet with my back wheels against the wall – the door wouldn&apos;t close!! We had to take of foot plates etc and tuck my feet in to be able to close the door. My chair is a custom design for a small adult so a regular adult chair user would possible not fit. There is meant to be clear space under the finger wash basin and a mirror you can see from a sitting position but as you can see these were not provided. Being a men&apos;s toilet there was no bin for sanitary waste and incidentally no bin for continence pads in any toilet we saw. 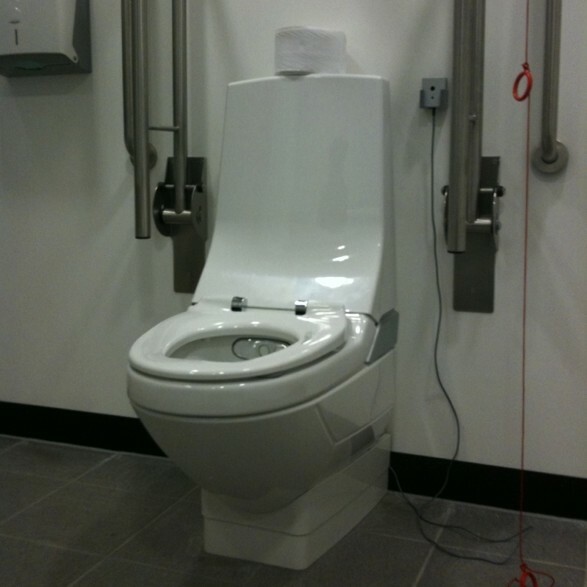 The toilet has no emergency cord which might be a problem for some people. If I was a women who could independently use the toilet then I would not be at all comfortable going into a men&apos;s toilet block. If I had a female carer then we are back in that awkward lurking situation. I will be doing a formal complaint to see if they can come up with a solution to some of these issues. When surgery is the only option. Tell it as it is – for world toilet day. People just don’t ‘get’ toilet issues. I have had numerous convos where I’ve said “Next time your on the throne, trying pulling your pants up without standing, good luck!” Thanks to my pelvic tilt, I’m uber screwed.